What can $5 million in hotel renovations buy you? If you’re the Hyatt Regency in the Denver Tech Center, it can buy you a pretty impressive new restaurant and bar set within a gorgeous new lobby and 2nd floor landing area. 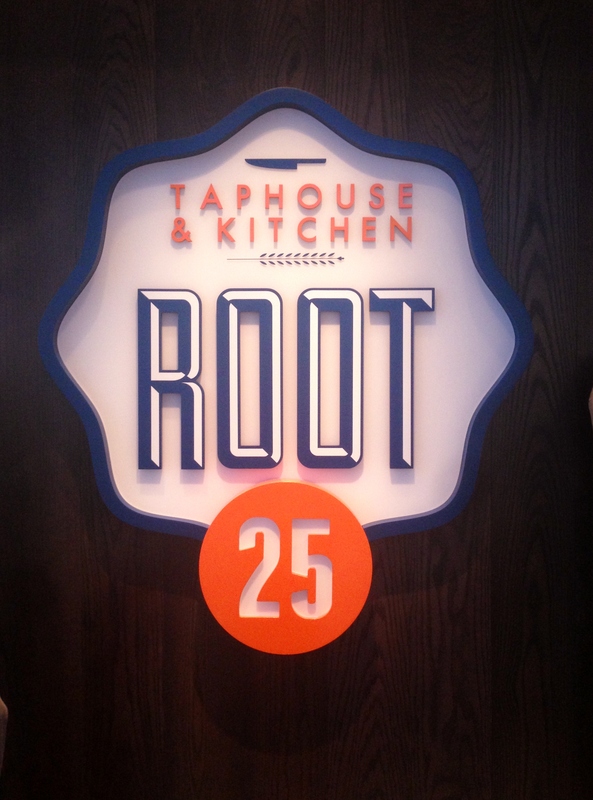 Root25 Taphouse & Kitchen takes the traditional hotel restaurant and bar to a whole new level. 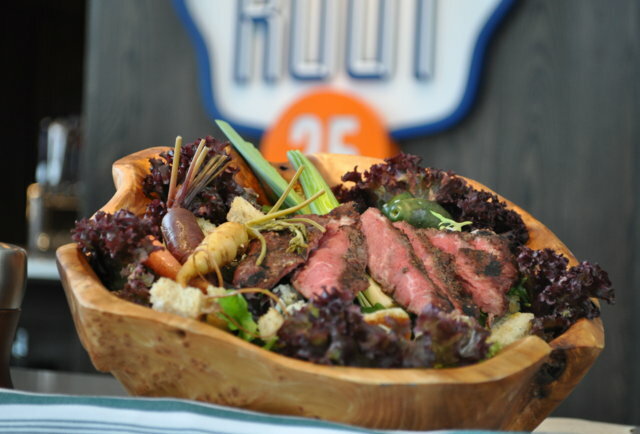 Root25’s gastro-pub concept has a Colorado spin on it, with locally sourced food, beer, and spirits. Hawaiian chef Kimo Akana creates seasonal dishes like a chopped bleu cheese steakhouse salad served in a unique wooden bowl, or a braised Colorado lamb dish served with toasted buckwheat groats and a red wine vinegar gastrique. The chef also brews his own beer (which was served on their opening night and tasted great), and uses beer in some of his dishes as well as a unique hop smoked pork sandwich. They’ve even got malt roasted chicken wings, complete with 3 delicious “Colorado crafted” sauces: Black lager buffalo, milk stout bbq, and spicy apricot blonde. Speaking of beer, Colorado’s favorite beverage is definitely front and center at Root25 (I mean, “Taphouse” is in their name, right?). They’ve got an impressive tap list with local favorites like Great Divide, Upslope, Avery, and Odell, as well as a rotating tap list that will showcase some of Colorado’s more unique brews. Pies in a jar. Incredible. They’ve even got their own personalized growlers you can fill up with whichever craft beer wins over your palette. Although a bit unusual for a non-brewery, Root25’s growlers are perfect for out-of-state visitors staying at the Hyatt Regency or for anyone living near the Denver Tech Center. In an area that’s a little lacking in the local brewery department, Root25 can fill any craft beer lover’s needs with 64 oz. of take-home bliss. For those staying at the Hyatt and visiting the Tech Center for business, Root25’s growlers are a great way to experience a big part of Colorado’s culture from the comfort of your hotel. No need to trek up to Boulder or Ft. Collins, the Hyatt Regency has everything you’ll need to experience why some call Colorado the “Napa of craft beer”. For locals, the new Root25 is the perfect mix of contemporary and classic. A new hardwood floor landing area right outside of the restaurant makes it feel like you’re at a fancy Larimer Square restaurant patio. Inside has a more classic rustic feel, complete with a pool table and big screens near the bar to watch the big game. The redesigned restaurant doesn’t feel like your average hotel bar and restaurant. 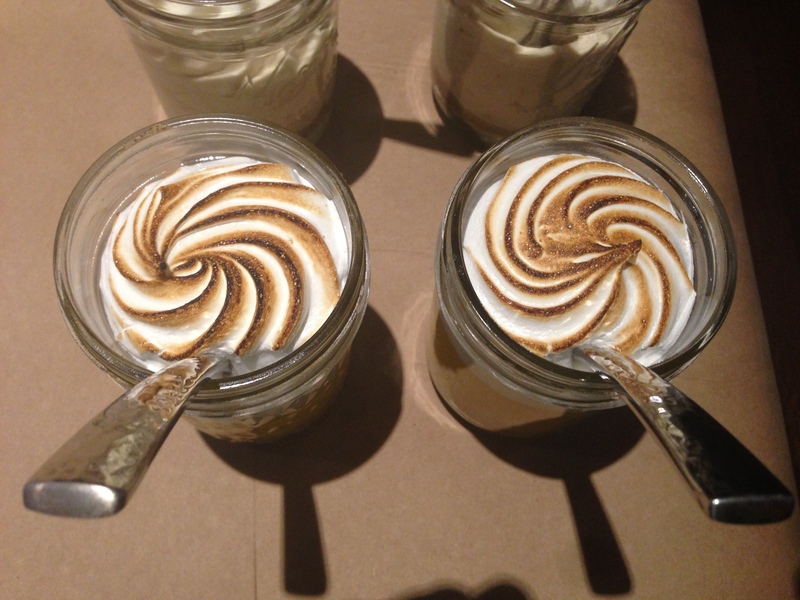 And with a great and flavorful menu, Root25 is a must for any Denver foodie.